Mimolette will never be queen of the prom. It is content to be a runner-up to the ever more loved Parmesan who, you just know, will win the popular vote. 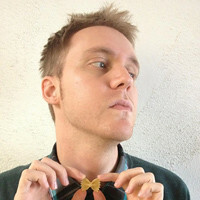 Still, it takes pride in the honor of being nominated. It shows that sweet Mimolette did something right to get there. The thing is you can't compare Mimolette to Parmesan as so many are wont to do. Often people pass it off as an cadmium-colored copy that looks more like a stunted cantaloupe than a good cheese. I can't lie to you, when you compare it to Parmesan it's no match in the creamy and nutty departments. No contest. But that's the thing; Mimiolette isn't Parmesan. 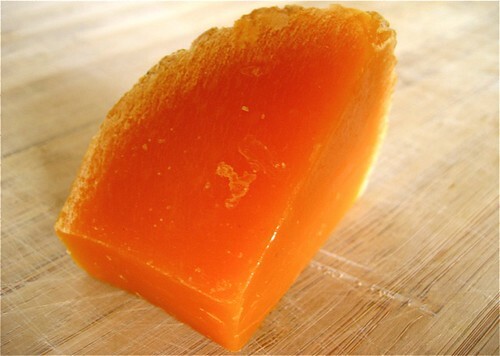 It's Mimolette, a traditional French cheese that most often originates from the city of Lille. You have to judge it on its own merits. The bright orange color comes from the addition of annatto giving the cheese spicy notes reminiscent of nutmeg and pepper. The flavor becomes bolder and evolves with age by sweetly adopting hazelnut flavors. Oily, strong, and salty it gains respect for what is it. A cheese with flash and bang. Who cares if Mimolette isn't prom queen on prom night? She leaves the room standing tall, and as time goes by she garners admiration by her own merits. The moonscape rind, one of its most distinguishing and charming features, is actually caused by cheese mites. 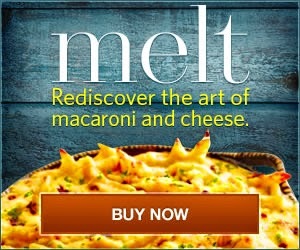 Intentionally added as they aerate the cheese and help it develop it's robust savory flavor. How many cheeses can boast that? Mimolette is a strong-arm flavor that can make any mac-n-cheese dish become a savory bomb to unsuspecting diners. Furthermore, it's a cheese that has the ability to match up perfectly with hoppy, amber colored beers. So give Mimolette a hand, take her for a twirl, you may just end up voting for the underdog in this race. One of my very favorite cheeses! Thanks for giving her a few seconds of fame. Thank you! I love, love, love this cheese. Oooh, I've never even heard of this but I am totally intrigued. Isn't annatto what they use to make "cheese" orange? Interesting that it's added here for flavor and not just color! I've never had this cheese. Now I'll look for it at my cheesemonger's! Agree w/ ScribbyKitty: I just recently discovered mimolette and its lingering savory-sweetness, and wondered how I've never heard of it before. Cheese mites be damned, it's now one of my mostest favoritests! I have never tried this cheese but now that you have introduced us... I am going in search of! 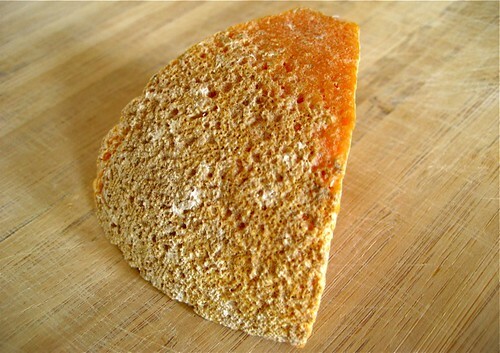 Thrilled to see a post about mimolette. My 11 yr old daughter loves it and Trader Joe's recently started carrying it. Discovered Mimolette a few years ago while experiencing a private tasting at Darioush Winery with their partner for the event, Cowgirl Creamery. It was served along with several others. Now it is one of my favorites. Thanks for profiling! Recently visited France and saw a Cheese MOF (otherwise known as a godly affineur) that was aging mimolette lovingly scoop us fallen dusty mites that had gathered at the bottom of the cantaloupe-like wheel and re-distribute them on the cheese. That's love. Am I the only one who finds the idea of eating insects vile?! Is there any way to know what cheese has bugs in it or is made from bugs and which are safe? This should illegal or at least give a warning. Gross!